Ziosa, Topi Jerami, Putu and 1 other person like this. Cyrus the Cactus, Mr. Kishido, Giano and 6 others like this. I went meh over Carrot power up ... but she looks really pretty ! Cyrus the Cactus, Mr. Kishido, Topi Jerami and 9 others like this. Still crying over Hinata's receive , can't wait for season 4 ! Mr. Kishido, Deleted member 24959, Lindltaylor and 8 others like this. Mr. Kishido, Deleted member 24959, Giano and 8 others like this. You ship zoro and nami? Mr. Kishido, Deleted member 24959, Maggi and 5 others like this. Mr. Kishido, Deleted member 24959, Maggi and 4 others like this. La passion et les rêves sont comme le temps : rien ne peut les arrêter. Mr. Kishido, Deleted member 24959, y-fo and 12 others like this. Mr. Kishido, Maggi, y-fo and 1 other person like this. Mr. Kishido, Maggi, ChanChan and 1 other person like this. Cyrus the Cactus, Mr. Kishido, Maggi and 2 others like this. So i visited the Luffy vs Kata thread and waw ! WAW ! it's worse than the fan wars of Kpop fandom ! WAW !! Dragomir, Deleted member 24959, y-fo and 15 others like this. Deleted member 24959, Maggi, ChanChan and 3 others like this. Deleted member 24959, Maggi, y-fo and 3 others like this. Deleted member 24959, Maggi, ChanChan and 1 other person like this. Lindltaylor, Ziosa, Roronoa D. Luffy and 6 others like this. Lool they're so cute !!! Luffy will think that is a food or something haha xD . Deleted member 24959, Lindltaylor, Maggi and 6 others like this. Stepping back from the little disappointment upon the Wano delay , i 'm actually really glad that Oda is doing it. Lindltaylor, Ziosa, Roronoa D. Luffy and 7 others like this. i understand Luffy being there , but big mom ? why ? how ? for what ? Lindltaylor, mad monk, Ziosa and 6 others like this. Lindltaylor, Ziosa, HEART Rainbow65 and 6 others like this. 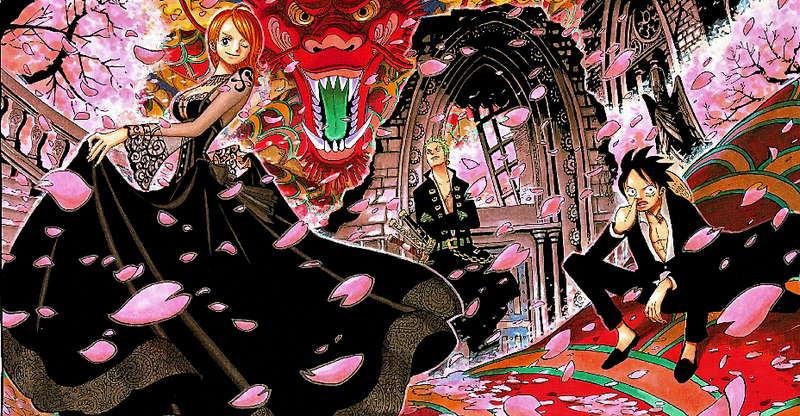 Yonko being there just to Zehahaha the world gouvernement :D i can accept it ! Lindltaylor, Ziosa, HEART Rainbow65 and 5 others like this. Deleted member 24959, Ziosa, Maggi and 4 others like this. Thabeast, Deleted member 24959, Ziosa and 5 others like this. HEART Rainbow65, Deleted member 24959, Ziosa and 5 others like this. HEART Rainbow65, Deleted member 24959, Roronoa D. Luffy and 6 others like this. I remember it was from older episode, clearly pre-timeskip because I watched it on local TV which stopped aired One Piece years ago, but can't remember the exact arc. Was trying to google the panel of it, but to no avail, hence I'm wondering whether it's actually just anime only. Deleted member 24959, Ziosa, mad monk and 3 others like this. Ah it seems you are true! The youtube link indeed shows that dialogue. Although I still kind of doubt it was also from another scene, because iirc, the scene happened on less danger situation when their life wasn't at stake like this one..
Lindltaylor, Maggi, Deleted member 24959 and 4 others like this. Thanks for the follow, I gotchu back. Lindltaylor, Deleted member 24959, Maggi and 4 others like this. Lindltaylor, Deleted member 24959, Maggi and 5 others like this. Deleted member 24959, Maggi, Lindltaylor and 5 others like this. Deleted member 24959, Lindltaylor, Ziosa and 9 others like this. @Nanashi , it was pretty much sarcasm :p but really thank you for writing this so whoever read it ,stop saying "plot convenience" and "plot armor" whenever they see it fit. Deleted member 24959, Roronoa D. Luffy, Maggi and 5 others like this. sorry i don't get the sarcasm before. lol. but yeah criticizing plot convenience/armor it's actually pointless, because that what made the story. it's like criticize a drink because it's contain water. Deleted member 24959, Maggi, Trafalgar Rao and 5 others like this. no need to apologize :D and i couldn't put it any better. Deleted member 24959, Roronoa D. Luffy, Maggi and 6 others like this. Seriously.....1-2 years yet for Wano.....? What the hell. IF ODA DOESN'T GIVE JUSTICE TO ZORO AFTER ALL THAT TIME I SWEAR I'M GONNA CHASE HIM WHATEVER HE IS. Thabeast, Maggi, Deleted member 24959 and 8 others like this. Today I was extremely sad about that, but the more I had time to think , the more I've started to realize. It will be painful, but when that moment will come, we will see one of the best character ever made shining like anyone else inside this manga, luffy aside. Topi Jerami, Maggi, mad monk and 5 others like this. Topi Jerami, Maggi, mad monk and 4 others like this. so we will flock around in my profile for the next two years ? You are all very welcome . Who knows maybe we will meet in actual wano ( Japan ) for real in two years..
Lindltaylor, Thabeast, mad monk and 11 others like this. Lindltaylor, Roronoa D. Luffy, Topi Jerami and 5 others like this. Lindltaylor, Topi Jerami, Maggi and 4 others like this. Lindltaylor, Deleted member 24959, ArinDee kinas and 6 others like this. I keep having a sudden creeping thought that Buggy's quest for Captain John's treasure will end up him and his crew finding the Onepisu 1st ;D , Oda would love doing that legit. Lindltaylor, Deleted member 24959, ArinDee kinas and 5 others like this. Lindltaylor, Deleted member 24959, y-fo and 4 others like this. Buggy finds the one piece but ends up being marooned on the island. SH shows up but and Buggy tries to steal the ship.Luffy beats himand becomes the PK. Lindltaylor, Deleted member 24959, Topi Jerami and 4 others like this. Brulée for Pirate Queen ! Deleted member 24959, Roronoa D. Luffy, Naomi Rose and 8 others like this. Deleted member 24959, Naomi Rose, Lindltaylor and 5 others like this. you had me worried for a minute ! Roronoa D. Luffy, Deleted member 24959, Naomi Rose and 6 others like this. Deleted member 24959, Naomi Rose, ChanChan and 5 others like this. ChanChan does not have any items.